The eight white boxes in a weedy, fenced-off field behind the big red barn at Eastern Washington University are absolutely crawling with life. Assistant professor Jeni Walke, flanked by undergraduates clad head-to-toe in white protective gear, opens the lid of one of the boxes and pulls out a panel to reveal the contents: honeybees, tens of thousands of them, writhing on the cells of their artificial hives. She turns over the panel as the bees buzz and scurry about. There — she points to the bee with the big abdomen and the hot pink dot — that's the queen. Half of these hives are fed on sugar. And half are fed with an artificial nectar treatment. Does that matter? That's what Walke is trying to figure out. Walke is interested in the honeybee, yes. But she's really interested in much smaller creatures. For those, you'll want to go smaller. Up the bee's proboscis, through the esophagus, into the bee's thorax and into its stomach and the rest of the digestive tract. That's where you'll find the millions of microscopic creatures that live in the bee's guts, she says. And the contents of those guts lead to a lot of questions. Like, what do bee guts look like when the bees have been fed artificial nectar instead of the traditional sugar? What about when they have been exposed to pesticides? What about when their hives are infected with parasitic varroa mites (which are the scourge of hives across the country)? What about when they're fed probiotics — the sort of bacterial mixes you'll find advertised in yogurt ads with smiling, laughing women? 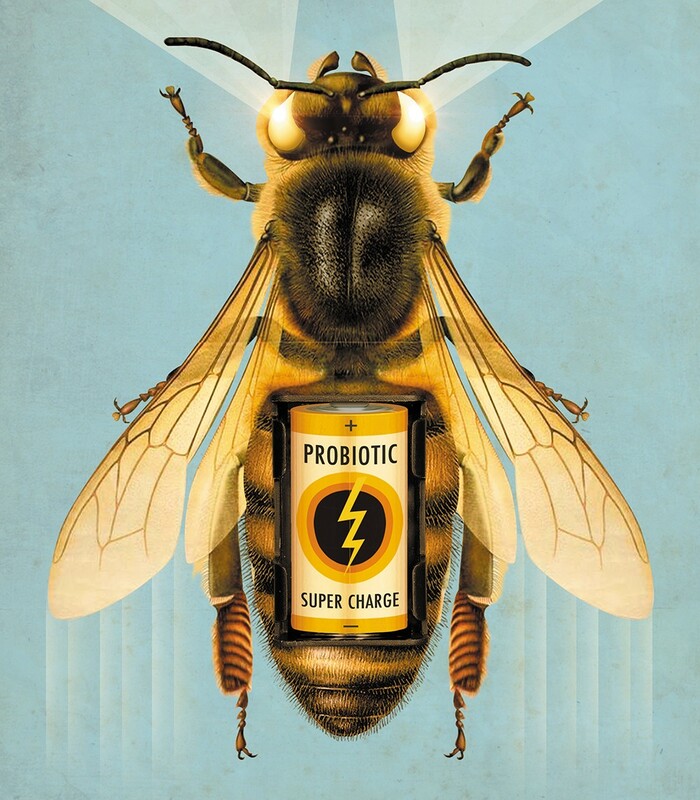 Could those probiotics actually protect the bees from pesticides? "We could potentially supplement the bee-gut microbiome with a beneficial microbe, to protect them from the potential effects," Walke says. Because at a time where beekeepers are still fighting against the dangers of colony collapse, exactly which creatures are living in each bee's stomachs may mean the difference between death and survival. "Native bees are definitely experiencing declines. Managed honeybee hives in general are still experiencing losses," Walke says. "I think, last I looked, a couple years ago, 30 or 40 percent of hives are lost each year." There are a lot of reasons for the losses. But that's one of the reasons why this research is so important. It could, down the road, save bee lives. Walke and her team can get a readout of the approximate mix of the microbes swimming around a bee's digestive system. And then she can see how that mix changes if you change what the bee eats. Place a jar of sugar or nectar spiked with a probiotic in the hive, for example, and you can begin to change what the bees are like internally. In fact, there's already a product being marketed to beekeepers called "SuperDFM-Honeybee" from Strong Microbials. Strong Microbials brags that its substance "helps boost immunity," "supports gut health" and is an "excellent digestive aid." They're the sort of health claims you might find at a Portland smoothie stand, but, you know, for bees. It doesn't seem to all be hype, either. "I've actually tested that probiotic," Walke says. "There might be something with that mitigating the effects of the pesticides." That research is preliminary, she cautions. Science has to be replicated. But in the meantime, there are a whole lot of bees to study. Everywhere. The original print version of this article was headlined "Building a Better Bee"